The Qashqai and X-Trail are two of Nissan's compact crossover SUV’s made by the innovative Japanese automaker that are sold in European, Asian and Canadian markets. Both vehicles can now be added to the ever growing list of engines that are enhanced with the help of a K&N replacement air filter. Qashqai is a sleek, dynamic, elegantly styled SUV. Despite it’s classy look it is also a surprisingly capable off-road vehicle. The X-Trail on the other hand is a big, tough, well equipped SUV that is as adept off-road as it is on them. 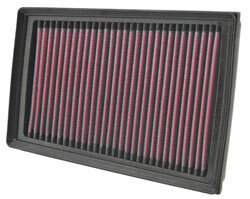 K&N’s 33-2944 replacement air filter helps keep both of these vehicle's engines running at peak performance. The 33-2944 air filter is designed to improve horsepower and acceleration while keeping the engine clean with it’s excellent filtration. On the road or off,K&N performance air filters are designed to protect your Nissan engine from all elements. K&N stock replacement air filters for street vehicles are covered by our famous K&N Million-Mile Limited Warranty™ and will be the last air filter your vehicle will ever need.